Is it possible to embed a single Lesson tile into a website rather than an entire Lesson of tiles? Take advantage of our great range of Lesson templates to add some interactivity to your website! Yes - you can embed a single tile from a Lesson onto your website by following these simple steps. Create a new Lesson, and add the tile you want on your website to the Lesson. Make sure you publish your Lesson once you're done. 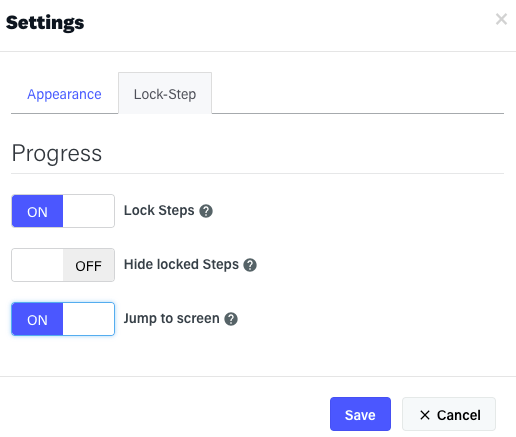 Open the Lesson settings panel to access the Lock-Step settings. Turn ON both the 'Lock Steps' and 'Jump to tile' options, and then click Save. Go to the Share page to get your embedded code. If you're unfamiliar with our sharing options, see our article on sharing a Lesson via URL.